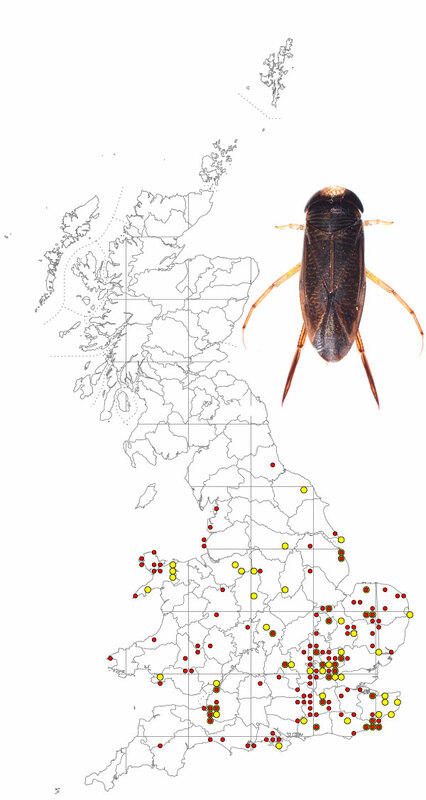 This is a local species with a scattered distribution throughout England and Wales. It can be found in woodland detritus ponds where much of the vegetation may consist of flooded grass and other situations where grass and /or moss are submerged, often in temporary habitats. The map is based on records from NBN Gateway, with yellow dots showing pre 1990 records, reds dots 1990 – 2015 records and red on yellow dots overlapping records. There are only 3 recent records for Ireland, two in the north and one on the south. H. moesta, like H. castenea, is a smaller species (5.5 – 6.0 mm) than the two common Hesperocorixa spp (H. linnaei 7.0 – 8.0 mm & H. sahlbergi 7.0 – 9.0 mm), with brownish pronotum and elytra and with little contrast between the light and dark areas. It can be separated from H. castenea by the length of the middle claws, which are the same length or shorter the adjoining tarsi in H. moesta but longer than the tarsi in H. castenea.